Summary: Lingvist is a great language learning tool which relies primarily on flashcards. It is an intelligent resource which judges your fluency level in the language and accordingly sets the difficulty of the questions for you. It also has a separate challenges section that trains your reading, listening, grammar and speaking skills. While the resource is a simple one, it is quite addictive and fun to use. It’s only suitable for beginner or intermediate level learners. The app is designed exceptionally well with content that was clearly well thought through. Easy to learn lots of new words and improve your grammar, but it won’t take you past the intermediate level. A monthly subscription is rather expensive, but prices become more reasonable with longer subscription lengths. Price: The free version allows access to most features but is limited in some ways. Paid subscriptions vary by length; the monthly plan costs $22.95, quarterly is $15.98 per month, and yearly is $7.50 per month. Alternatives: Babbel or Duolingo would be suitable alternatives. Beyond that, my recommendations would change depending on the language you’re learning. Flashcards are one of the most popular and effective tools for learning the vocabulary of a new language. Lingvist has used this very principle to make it easier to memorize new words and learn how to use them in context. However, Lingvist isn’t the typical flashcard app that you may already be familiar with. There’s a lot more to it than that. It teaches many languages in the same way, and for this review, I decided to try it out for studying French. It reminds me quite a bit of Duolingo though perhaps a little less fun and a little more effective. There are three main ways that you can learn using Lingvist – Learn, Grammar Tips, and Challenges. Learn is where you improve your vocabulary using flashcards. Grammar Tips is essentially a long text about the different grammatical rules followed in the language you’re learning. This will help you complete your exercises in the Learn section. Finally, Challenges is where you test yourself using whatever you have learnt from the earlier two methods. There is also a community forum which you can look to if you have any lingering doubts, but it is not a part of the core learning process. While there isn’t a rigid structure to Lingvist, it’s still fairly organized. The difficulty of the flashcards depends on the user – if the user is doing well, the difficulty is increased. You can also choose a topic, with examples including: General Language, Beginner Level, A weekend in Paris, and the Intermediate Level. You simply need to answer as many of these questions as you want throughout the day. There is no particular goal that you need to hit to reach a new level and you can do it at your own pace. Then you have the challenges section which is divided into Speak, Listen, Grammar and Read. Each of these have 10 levels each and about 2 – 4 exercises per level. It’s worth noting that these challenges are limited and won’t change according to the difficulty level that you have set. Though the challenges are split into levels, you can do any challenge whenever you want. Again, there is no mandate that says you must complete these challenges to access more content. Finally, you have the grammar tips section. This is quite literally a summary of all the grammar rules of the language. While the guide doesn’t go into great detail, it is great for understanding the basic rules of the language. This is purely for your own reference to help you learn the language better and help you out in the lessons and the challenges. The process of getting started is about as easy as you could ask for. All you need to to is sign-up, then you’re ready to get going. Once you sign up you get to choose which language you want to learn. There are four primary choices for this – Spanish, German, Russian, French. For the purpose of this review, I tried out the French course. After selecting your language, they ask about your fluency level. Surprisingly though, there are only two options – beginner or an expert. Unfortunately, there are no other levels in between. But don’t worry about it, Lingvist has a solution for it. If you are unsure exactly how good you are, you can just select the beginner level. As you start answering the questions correctly, Lingvist will determine that you are not a beginner after all and start gauging your true level. It does this for several words to check how much you know of the language. It then estimates a percentage of words that you might know of the language and accordingly adjusts the difficulty level for future questions. Once this difficulty level is set, you can get started with your learning. The only other things that you can do is to switch from beginner level lessons to intermediate lessons. You can also choose to opt in for daily reminders via email or the application. As I mentioned before, there are primarily three ways to learn. Let’s first take a look at what’s included in the learn component. The main part of Lingvist’s lessons are their flashcards. In this part, you will be shown a French phrase with a word missing. The translation of the French word (or one of its forms) is mentioned right below the question. All you need to do is fill in the missing word. Since sometimes the French word that is to be used varies depending on the context, the translation of the whole sentence is available right above the question if you click the arrow in the corner. Clicking on individual words gets you their translations as well. To help you with accent marks on some of the letters, you have the option of using as virtual keyboard. So, what happens if you can’t guess the word? The phrase is reset and now they tell you what the word actually was and ask you to type it in. If some of your letters were correct, they show that in green, while the ones you didn’t guess are in red. Along with prompting the word to you, they also provide you with some information on how to use the word. This feature is extremely useful when you for verbs. For verbs, an entire table of all the conjugations in all possible tenses is shown to you for your reference. You can go through these to ensure you won’t make the same mistake again if a similar word is asked. For other words, there are some basic rules presented to you. You might get it wrong when you are typing it in for the second time since the rest of the letters disappear soon after you enter the first few. So, you may have to repeat this process multiple times if you don’t remember the spellings on your initial attempt. Like the flashcard system, if you don’t get the word right on the first try, it is added to a list of words you need to learn. These words are then presented to you at regular intervals. You need to get them right 4 more times to change the status of the word to “learnt”. While there is no particular number of lessons that you need to complete in a day, Lingvist suggests a minimum of 100 a day to learn properly and fast. That may sound like quite a few, but given how easy it is to fill these, it barely takes any time to achieve complete. As great as the whole system is, there are a few shortcomings. For one, while the blank is present for the word, there is exactly enough space provided for those exact characters to come there. This narrows the possibilities of the words thus making it quite a bit easier. Another flaw that I spotted was that the system does not pay attention to the accents in the French language as you submit; not even in the intermediate level. While this is a common feature in most online French resources, I felt that since the virtual keyboard provided is so easy to use, the accents should be checked. The second way to learn is doing challenges. The challenges are divided into four categories – Read, Listen, Speak and Grammar. Each of these are then sub divided into various levels. Each level might have one or more questions. Unfortunately, the number of challenges is fixed and there is no difference between the intermediate challenges and the beginner ones. You could either solve all the levels of a category first or could go progress level by level in all categories – choose whichever approach suits you the best. However, I would strongly suggest the latter. In the case of challenges, they don’t reveal the answer but wait for you to get it. The wrong answer invokes no tips but the right one tells you why you are correct. In the grammar challenges, you will be asked various multiple-choice questions and you must choose the appropriate option. Listening skills on the other hand requires you to listen to an audio file and then select what you heard among the options. For the speaking skills you will have to attach a microphone and read the sentence out loud. The website picks it up and tries to match it with the pronunciation in its directory. For those who really want to work on their pronunciation, I’d suggest trying out Speechling. There you’ll be able to record yourself repeating sentences and get feedback on your pronunciation. Another good option would be to find a very affordable tutor from a platform like italki. Finally, the reading challenge is essentially a French comprehension where you read from it and the answer the question in English. While most of these challenges run smoothly, you might sometimes face a problem with the speaking skills. Moreover, you start to yearn for more challenges since they are in fact limited. While there is no mandatory requirement to complete these challenges, doing so helps you accomplish your daily goals. This is the simplest component of Lingvist.. It is essentially a list of French grammar rules. From pronunciations to verb tenses, you will find everything here and it’s really a useful feature. If your grammar skills are already pretty strong, you could simply skip this section. For me, the combination of these grammar lessons and the learn section is exactly what I need to complete all the challenges and improve my French. Along with the basic learning features, there are several other benefits to using Lingvist as well. Lingvist has a popular community forum with plenty of topics being discussed and regular updates. All the topics have been arranged well and a search bar makes everything easier. This is a great way to clear any questions that may have confused you during any of the exercises. Learning a new language can be a tiresome process and your motivational will surely come and go. That’s why providing a form of external motivation can be extremely useful in keeping you on track. Lingvist does this in a few ways. The first one being that it shows you how many words you have learnt and how many words you need to practice. Straight away you can start practicing and improving. Another motivator is the daily goal that you can set. These daily goals generally require you to do a challenge, practice a few words, and learn some new ones. Some days you’re not going to feel like studying, these daily goals can help push you to get something done every single day. Finally, you can set a daily reminder to have sent to your email or phone to encourage you to come back each day. In your profile, you get to view a lot of stuff. These include progress and other words you need to learn. 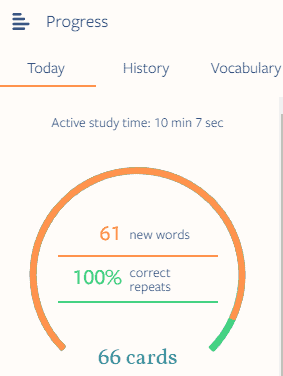 You can also see how many words you have practiced and how many more to go. You also have a history of all the words that you learnt and what you need to learn. There are three types of subscriptions possible while using Lingvist – monthly, quarterly, and annually. The one month price is fairly expensive at $22.95/month. The quarterly subscription comes out to $15.98 per month. The yearly subscription naturally lowers the monthly price the most, making it $7.50 per month. Fortunately, the free version of Lingvist isn’t so much different than the paid version. The free version limits the amount of new words you can learn in any day to 50 which won’t take long at all to go through. Another difference is that you won’t get to try more than one challenge a day. It is kind of a bummer, but the main component of Lingvist doesn’t rely too heavily on challenges anyway. The second feature is a major loss for some students, which is you can’t use the intermediate version at all. Lingvist is one of the most impressive resources that I have explored recently. The strange part is that it is fun to use despite being so simply designed. I would compare it quite closely with Duolingo since they are similar types of applications. 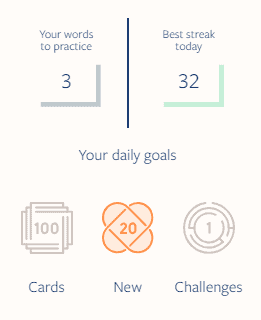 Duolingo has far more features, but it is much faster and simpler to learn using Lingvist. While you are answering questions in the learn section, you’ll be surprised by how quickly you learn new words. The intelligent system also gauges your fluency levels accordingly and gives you words that you may not know that well. I really enjoyed this adaptability. Coming to the negatives, I had to struggle to find a few. The most major one that I feel is that you will soon start finding the whole exercise mundane (since it is the same thing every day) and it will lead you away from this great resource as a whole. I have mentioned some other minor things throughout this post, but this is definitely my biggest concern. If you’re interested in trying Lingvist, I’d suggest starting out with a free plan and seeing how you like it. If you do decide that it’s a good fit, you make want to consider the quarterly or yearly plans.